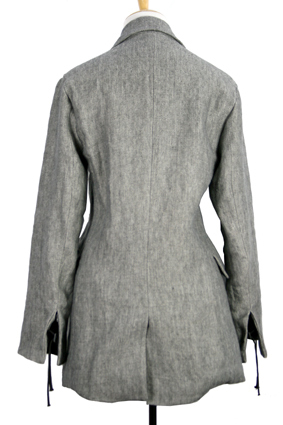 Barbara Bologna 2 button jacket in herringbone linen. Cut-out leather buttons attached by black woven fabric tape. 2 pockets with flaps. Cuffs with oblong leather buttons and black fabric tape fastening. Small central vent at rear. Fully lined in black cotton fabric. This is a beautiful jacket, soft and easy to wear that matches the trousers in the same fabric. Buttons up men way.